During a crisis interview a client will frequently give the counselor a great deal of information about himself and his crisis. Oftentimes this information will come pouring out in such rapid fashion that if the counselor is not prepared, he can get confused and overwhelmed, missing valuable points. Since all of this information is so important to the counselor in forming a comprehensive picture of his client’s crisis, it is necessary to have some kind of plan regarding the organization of this information. The deductive model is an example of such an organizational plan. The deductive model provides the counselor with a way of identifying and organizing client information that will facilitate the process of crisis resolution. We stated earlier that the goal of each interview was to get information about such things as precipitating events, strengths, deficits, previous coping experience, and so forth. With this as the goal, then, some diagram of how to catalog all this data is necessary. 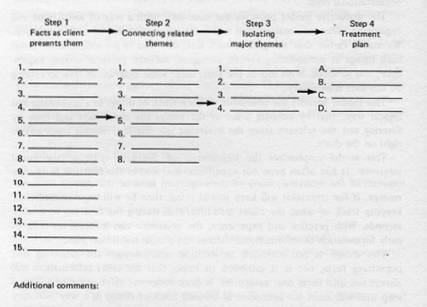 This model permits the counselor to keep track of things in a systematic and logical way, first by keeping a list of the things the client says and then by filtering out the relevant from the irrelevant information, moving from left to right on the chart. This model emphasizes the importance of the early part of the initial interview. It has often been our experience that within the first ten to twenty minutes of the interview, many of the important facts of the client’s crisis will emerge. If the counselor will keep this in mind, then he will begin immediately keeping track of what the client tells him, even during the first ten to twenty seconds. With practice and experience, the counselor can increase his skills at early formulation of informational themes and a crisis resolution plan. This model is not intended to exclude other designs for gathering and organizing facts, nor is it intended to imply that the crisis information will always fall into these neat categories. It does, however, offer a plan or a mental map that will assist the counselor in keeping track of things in a way that may reduce confusion. With practice and rehearsal, along with some other teaching aids like a tape recorder or an observer, this technique can be mastered to the benefit of both client and counselor. Many of the major crisis themes have been isolated in actual practice by a variety of counselors in training, most of whom report that after a few concentrated attempts they are able to employ the model successfully. These counselors have found the method helpful during the initial phase of the interview. The preceding section contained information about a deductive model for crisis interviewing. Write three case study examples regarding how you might use the content of this section in your practice. When during the crisis interview are the important factors in the client’s current crisis state likely to emerge? Record the letter of the correct answer the CEU Answer Booklet.